Seriously, WHERE DO ALL THE PENS IN MY HOUSE GO?????????? It's no joke. They just always disappear. And so when I have one pen, I hide it from my kids and everyone else! It's MINE! I need some pens, man! Gimme!!! 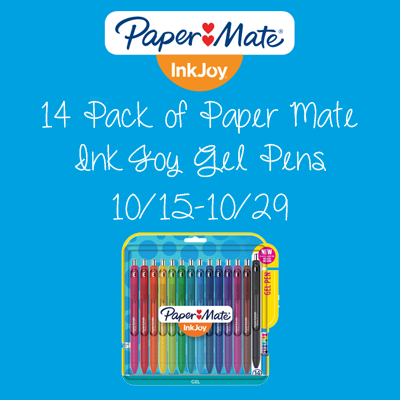 Spread joy (not smears) with quick-drying Paper Mate InkJoy Gel Pens. With vivid gel ink that dries 3X faster* for reduced smearing, it’s like a party on the page where smudges aren’t invited. With 14 brilliant colors to choose from, your notes will be bright and filled with fun. Perk alert: these colorful pens are fully wrapped with a comfort grip (because words should never hurt you) and feature a smooth style that keeps the joy flowing as fast as your thoughts. Enter to win using the widget below. Good luck! Disclosure: JamericanSpice did not receive compensation for this post and is not responsible for prize fulfillment. So What if Your Dreams Will Cost You Something? Chase Them Anyway. Transform Your Home’s Exterior, with These Super Simple Ideas! Brush Buddies - Make Brushing Fun!